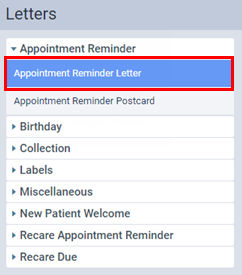 You can set up the filters for any letter template (which you can merge with patient and practice information) to specify who should receive a letter of that type. On the Letters page, select the type of letter template that you want to set up filters for. You can choose from the following types of letter templates (which are contained in sections that you can expand and collapse): Appointment Reminder, Birthday, Collection, Labels, Miscellaneous, New Patient Welcome, Recare Appointment Reminder, and Recare Due. The options for that letter template appear, and the Filters tab is selected by default. As needed, set up the filters to specify who should receive a letter. Patient Type - Click (or tap) this header to filter the recipient list by patient type. 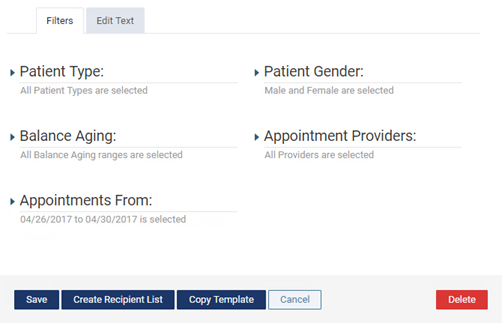 Select All to have patients with any patient type be recipients, or select the check boxes of the types of patients who you want to be recipients. 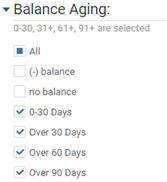 Balance Aging - Click (or tap) this header to filter the recipient list by account aging. 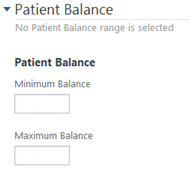 Select All to have patients with an aged or a negative balance be recipients, select the check boxes of the aged account balances of patients who you want to be recipients, or select the (-) balance check box to have patients whose account balances have a credit be recipients. Birthday - Click (or tap) this header to filter the recipient list by a range of birth dates. Type a date range, or click (or tap) in the field to select Next Month, Specific Date (choose the date), or Custom Range (choose the dates). To filter according to only the month and/or day, select Ignore birth year. The Birthday filters are available only for letters or postcards that are Birthday templates. 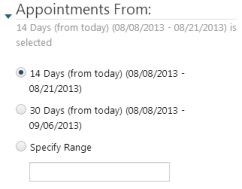 Appointments From - Click (or tap) this header to filter the recipient list by appointment date range. Select 14 Days (from today) to have patients with appointments that are scheduled within the next 14 days be recipients; select 30 Days (from today) to have patients with appointments that are scheduled within the next 30 days be recipients; or select Specify Range, and then select today's date, Next Month, Specific Date (choose the date), or Custom Range (choose the start and end dates) to have patients with appointments that are scheduled within the specified date range be recipients. The Appointments From filter is available only for letters or postcards that are Appointment Reminder or Recare Reminder templates. Appointment Providers - Click (or tap) this header to filter the recipient list by appointment providers. Select All to have patients with appointments with any provider be recipients, or select the check boxes of the providers of appointments for patients who you want to be recipients. Seen within the past - Click (or tap) this header to filter the recipient list by appointment date range. Select 14 Days (from today) to have patients with appointments within the past 14 days be recipients; select 30 Days (from today) to have patients with appointments within the past 30 days be recipients; or select Specify Range, and then select Next Month, Specific Date (choose the date), or Custom Range (choose the start and end dates) to have patients with appointments within the specified date range be recipients. The Seen within the past filter is available only for letters or postcards that are Recare Due templates or "new patient welcome (after visit)" templates (under New Patient Welcome). Registered within the last - Click (or tap) this header to filter the recipient list by appointment date range. Select 14 Days (from today) to have new patients who had appointments scheduled within the past 14 days be recipients; select 30 Days (from today) to have new patients who had appointments scheduled within the past 30 days be recipients; or select Specify Range, and then select Next Month, Specific Date (choose the date), or Custom Range (choose the start and end dates) to have new patients who had appointments scheduled within the specified date range be recipients. The Registered within the last filter is available only for letters or postcards that are "new patient welcome (before visit)" templates (under New Patient Welcome). Patient Gender - Click (or tap) this header to filter the recipient list by patient gender. Select Male and/or Female to have patients of the selected gender be recipients. You must select the check box of at least one gender. To include primary and/or secondary insurance plan coverage, under Search for, select Primary Insurance and/or Secondary Insurance. 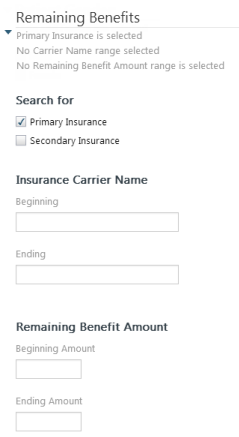 To include only benefits for patients with certain insurance carriers, under Insurance Carrier Name, type a letter or several letters (or select a carrier from the results list that appears as you type) for the Beginning and Ending values of the range. Leave either of the fields blank to have an open-ended range. Leave both fields blank to include all carriers. To include patients with benefits within a minimum and maximum amount, under Remaining Benefit Amount, type the Beginning Amount and Ending Amount. Leave either of the fields blank to have an open-ended range. Leave both fields blank to include any amount. 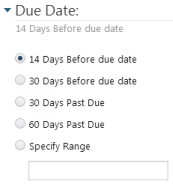 Procedures/Treatment Plan - Click (or tap) this header to filter the recipient list by treatment plans that were created with a specified date range but have not been scheduled. Under Search for, select Outstanding Treatment Plan. To include only treatment plans that were created within a certain date range, in the Select Treatment Plan Range field, type a date range, or click (or tap) in the field to select Next Month or Custom Range (choose the dates). Leave the field blank to include treatment plans that were created on any date. 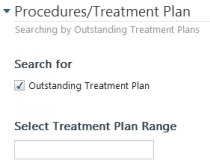 The Procedures/Treatment Plan filters are available only for a letters that are "outstanding treatment plans" and "year end treatment" templates (under Miscellaneous). Providers - Click (or tap) this header to filter the recipient list by patients' providers. Select All to have patients with any provider be recipients, or select the check boxes of the providers for patients who you want to be recipients. Due Date - Click (or tap) this header to filter the recipient list by due dates for patients' recare. Select whether you want to include recare appointments that are due 14 days before due date, due 30 days before due date, 30 days past due, 60 days past due, or due within a specific date range (next month, a specific date, or a custom range). The Due Date filter is available only for letters or postcards that are Recare Due templates. Recare Type - Click (or tap) this header to filter the recipient list by patients with specific recare types attached to their records. 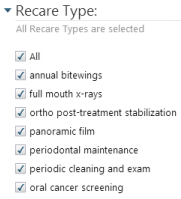 Select All to have patients with any recare type be recipients, or select the check boxes of the recare types for patients who you want to be recipients. The Recare Type filters are available only for letters or postcards that are Recare Due or Recare Reminder templates. Last Payment Date - Click (or tap) this header to filter the recipient list by patients who have made a payment within the specified date range. Click (or tap) in the Specify Range field, and then select Previous Month, Specific Date or Custom Range (select the start and end dates). The Last Payment Date filter is available only for letters that are "collection letter (range)" templates (under Miscellaneous). You can now generate a list of recipients who meet the specified criteria and then print the letter or postcard and/or label.